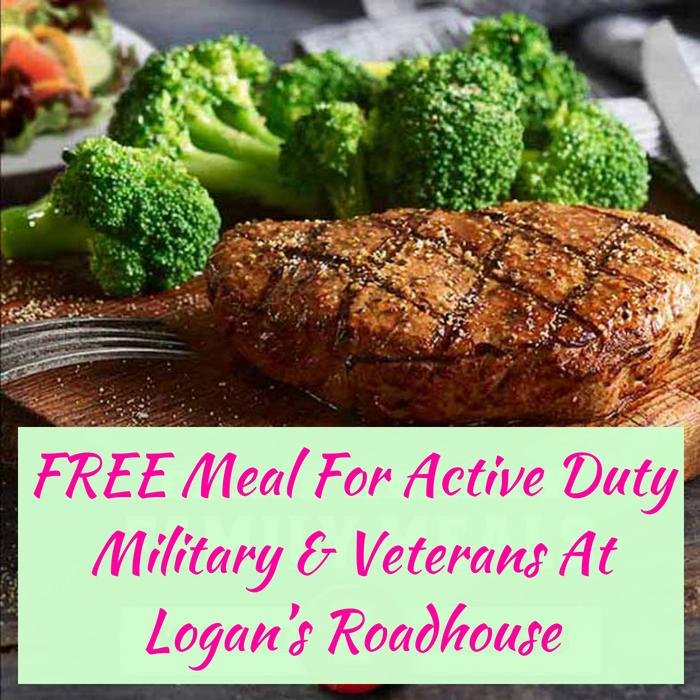 FREE Meal For Active Duty Military & Veterans At Logan’s Roadhouse! You are here: Home / FREEbies / FREE Meal For Active Duty Military & Veterans At Logan’s Roadhouse! TODAY, from 3pm-6pm only! Hurry over to Logan’s Roadhouse where Active Duty Military & Veterans can get a FREE Meal ($8.99 value) with their own choice from the American Roadhouse Meals Menu! All you need to do is go to a participating location with proof of service! This is available for dine-in only and cannot be combined with other offers. Enjoy! Hurry and get your FREE meal now!